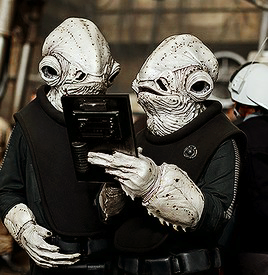 Let's get started on a Rogue One Mon Calamari discussion. So far I have been trying to figure out the background MonCal, the white ones. I read somewhere they are actually pale blue. Their uniform at first looks like a flight suit with a wool or felt vest on top. 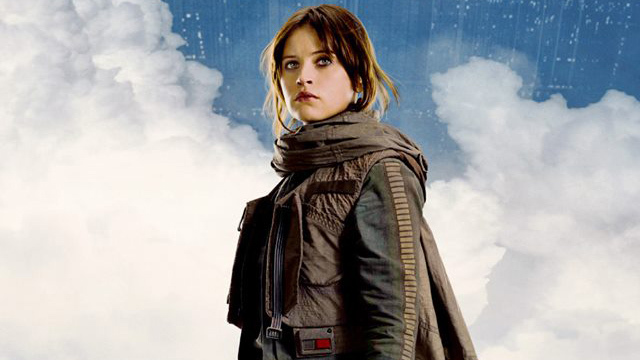 On close inspection I noticed the sleeves have no pleating and are sewn on stripes like the jacket Jyn Erso wears. I have no knowledge on how to build masks so, I will leave that to more knowledgeable people. I figure an Ackbar head would work well for the crew, Admiral Raddus would have to be completely custom. His vest appears to have stitching in the shoulders, It is hard to see the design. I haven't seen any close up photos of his uniform. Any and all input is greatly helpful. The costume itself will be under pilots or officers or possibly fringe. For the head you are in the right place. I would check the other forums mentioned above and see who is working on that costume. I have already checked and no one has started a forum yet. That was my inspiration for creating this one. I don't think they'll fall under pilots and the only officer would probably be Admiral Raddus. Fringe may be more fitting. check with the Legion Membership Officer - most of Rogue One characters are in Fringe. You could start a new topic and post the question there.